The Central Alaska Range has the biggest mountains in North America including Denali at 20,320 feet and Mount Foraker at 17,402 feet. The lower elevation peaks that ring these giants have a deep snowpack and perfect terrain for skiing. 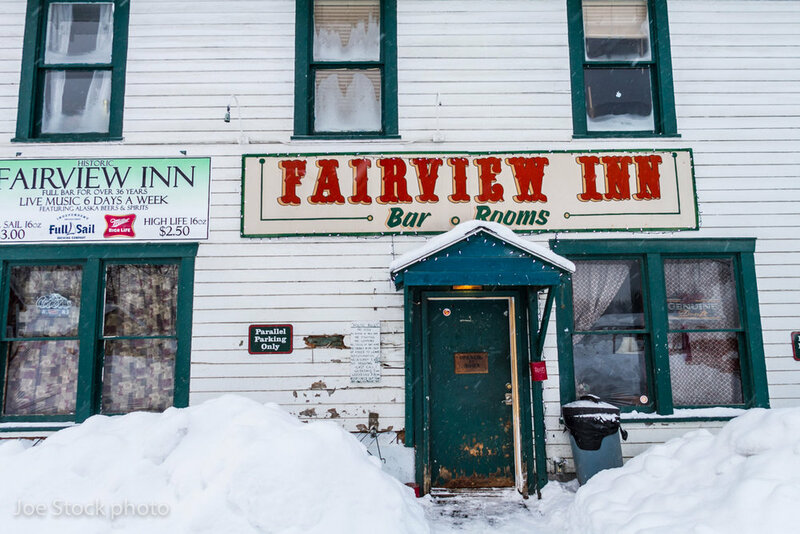 From Anchorage, we'll drive two and half hours north to the character-laden town of Talkeetna. After checking in at the Ranger Station, we'll weigh and load our gear into a Talkeetna Air Taxi bush plane and fly 45 minutes into the mountains. Once on the glacier, we'll set up a fat base camp and review crevasse and avalanche companion rescue skills. The next day we begin skiing and continue skiing as long as your energy and conditions allow. Our base camp will be fun and comfortable. We will sleep and cook altogether in a six-person dome tent that is tall enough for standing. The food is not gourmet, but plentiful and the kind you crave after a big day of skiing. The latrine will be either a Denali Clean Mountain Can or Luggable Loo so we can transport the waste out of the mountains. Where we go in the Alaska Range depends on conditions and your interest. 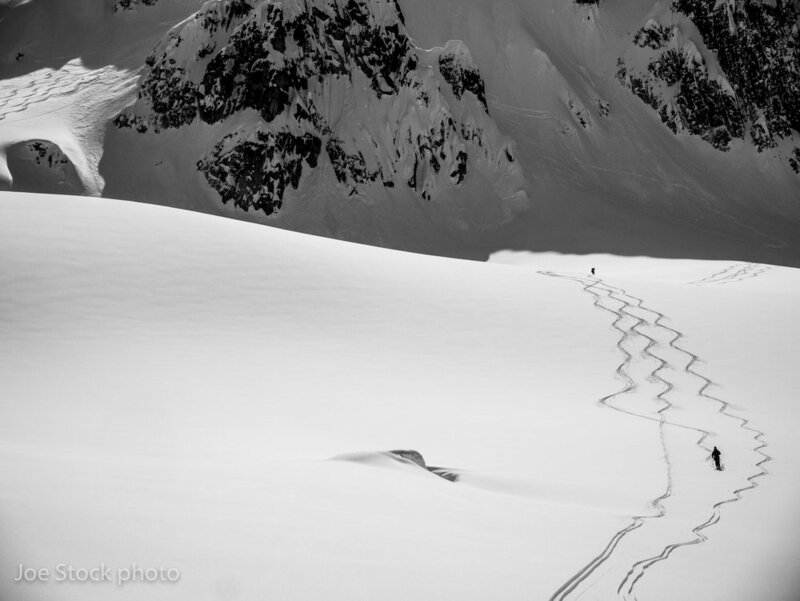 Terrain options exist for all abilities: from moderate glacier runs to steep chutes. Most of the skiing will be on glaciers, but these are mostly cirque glaciers that hang above the bigger valley glaciers. These cirque glaciers have smaller crevasses, which often allow us to ski downhill unroped. 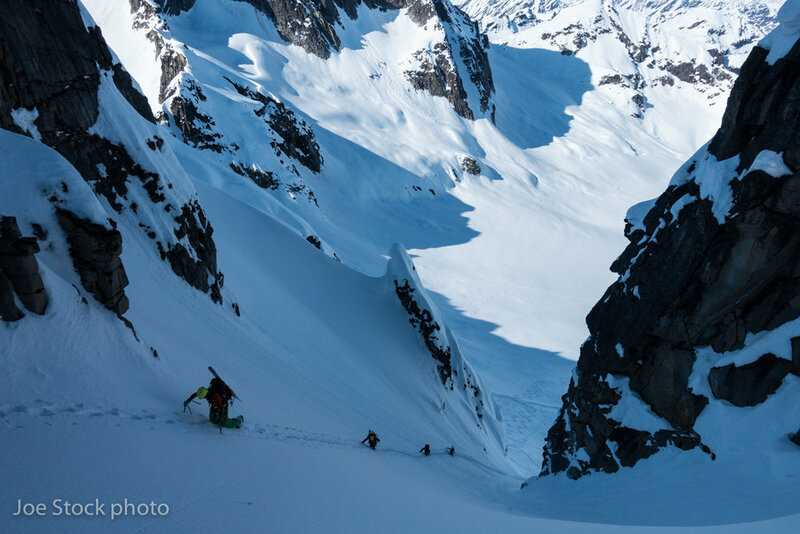 Popular Central Alaska ski mountaineering locations include the Pika Glacier in Little Switzerland, The Mountain House on the Ruth Glacier and Kahiltna Base Camp. 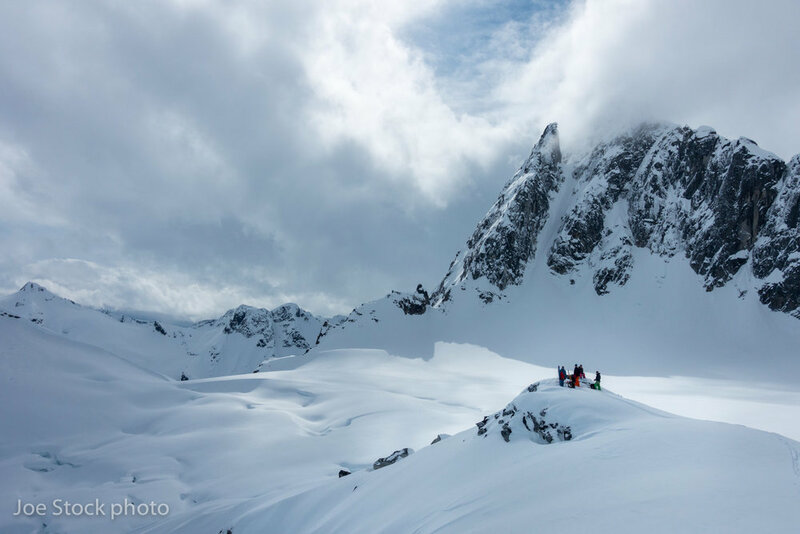 Where we go exactly depends on current condition reports from professionals in the area, Joe's recent trips, and Joe's knowledge of the area from 50+ trips into the Central Alaska Range. 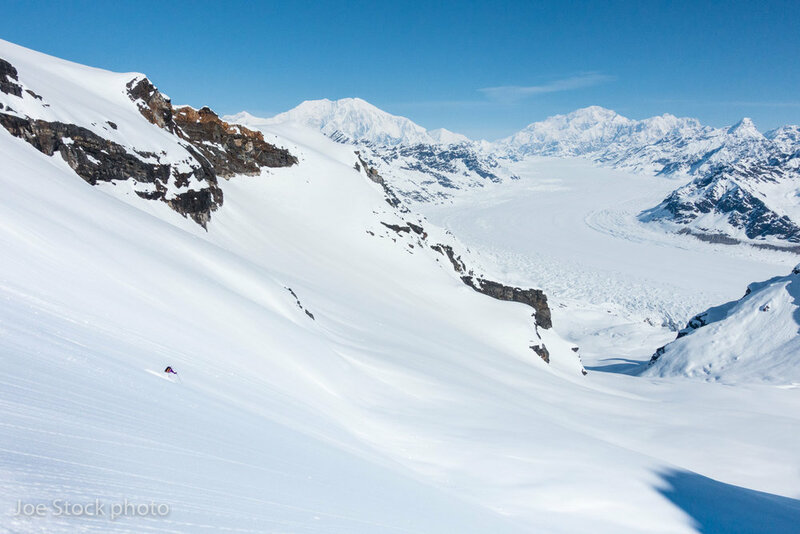 See Denali Ski Base Camp posts. Intermediate to advanced alpine ski skills. Endurance for consecutive full days in the mountains. Recent avalanche rescue practice. We will have assessment and review before our tour. Previous winter camping experience is helpful, but not required. Previous glacier travel experience is helpful, but not required. April-June. Six days on the glacier. Booking one year ahead is recommended. Day 0: Meet at your B&B in Anchorage at 5pm for trip overview and gear check. We'll make last minute gear purchases at AMH and REI and then have dinner at a brew pub. Day 1: Meet at your B&B at 7am. Drive two and a half hours to Talkeetna and load gear into a bush plane. Fly 45 minutes into the Alaska Range. After setting up a fat base camp, we'll review avalanche and crevasse companion rescue. If time allows, we'll go for an evening ski. Day 2: Tour all day. Day 3: Tour all day. Day 4: Tour all day. Day 5: Tour all day. Day 6: Possible morning ski. Pack up and fly back to Talkeetna for burgers and beer at the Denali Brewery. Drive back to Anchorage. Stay in Anchorage. Day 7: Fly home. To allow for weather delays, please leave Anchorage no earlier than the redeye on Day 7. In partnership with Alaska Guide Collective. AMGA/IFMGA Mountain Guide Joe Stock. A second guide may be added over four clients. Group cook gear, tents and ropes. Navigation, first aid and repair kits. Hotels. See the Southcentral Alaska logistics. Transport between Anchorage and Talkeetna. Using your personal or rental car is the best option. If possible, the guide will ride with you. Personal ski gear. See Backcountry Ski Gear List. Rescue and trip insurance. See Booking for details. Costs from schedule changes such as hotels, meals off the mountain, and transport. While air taxis add to the Alaska experience, they also add delays that are out of Stock Alpine control. We estimate that half of the fly-in trips have some flight delay. Air taxi delays include, but are not limited to: mechanical delays, multi-day weather delays both on the flight in and flight out, scheduling complications and pilot complications. Of course our goal is to minimize these complications and maximize the skiing and success of the trip. Alaska requires flexibility. If you are flexible the rewards are huge. If you have expectations and are not flexible then we recommend a trip elsewhere.